This is an extra special Valentines day PAINT and Sip event! Enjoy a fabulous dinner for two then the two of you join to share painting Audrey with loads of colour and flowers, all whilst SIPing through your BYO. This is a seriously creative, romantic, fun night out for two! That is right. A glass of bubbles each, a two course dinner for two, gelato and sharing a creative night painting with your partner, all for $160. This is a perfect chance to try something new and creative on a fun romantic night out! 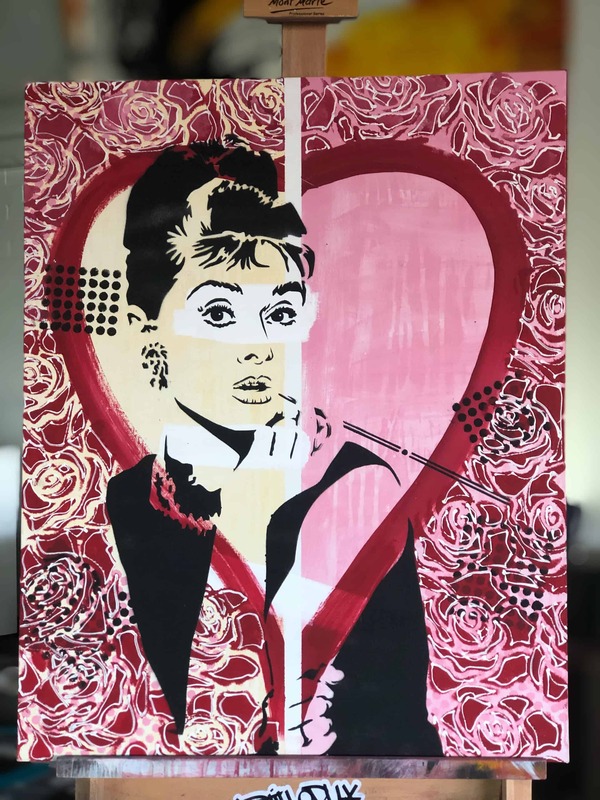 You’ll be bringing home an original one off stencil painting, painted by you and your partner on a quality 600x760mm double thick canvas in colours of your choosing. We will paint an interesting background in your choice of colours then spray on the lovely Audrey at Tiffanys. We will instruct the painting shown above with love heart and roses, but you are free to paint any background you choose. The art class is BYO however the resturant and bar downstairs are licensed. Please give your BYO to the bar staff upon arrival. We will ensure it is upstairs, ready for your class. Please arrive at or before 6pm; dinner from 6-7pm, art class starting at 7pm, dessert served during the class, aiming for a 9:30pm finish. Please print out and bring your ticket to present to the resturant staff.